Submitted by Dan Dooré on Wednesday, May 16, 2018 - 16:28. The Sam uses a membrane based keyboard much like the ZX Spectrum with flying ribbons back to the two Molex connectors on the Internal PCB to form the keyboard matrix. The keyboard membrane will, like the ZX Spectrum ’s, degrade over time leading to breaks or fractures on the tracks on the flyleads. This can often be repaired with conductive paint or with replacement membranes from 3rd parties. 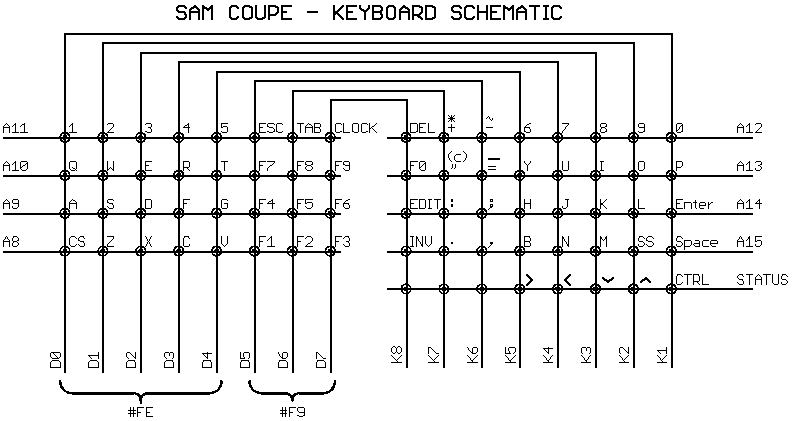 The joystick port also connects to this matrix but with a deviation from the standard Atari pin-out to allow two joysticks via a splitter by offering two different ground lines that drive different lines on the address bus, A12 for Joystick 1 (standard) and A11 for the second. There was another modification from Edwin Blink that allowed three joysticks to be connected. Note: Most standard joysticks have no connection for pins 5 & 9 and only use +5V for auto-fire or additional circuitry. Using the same port for both joystick connections is problematic as the shared nature of the connector coupled with making the joystick input appear as keyboard input made simultaneous movements on both joysticks interfere with each other. For a simple joystick doubler, you need two 9-way D plugs, and one 9-way D socket. Simply connect pins 1, 2, 3, 4, and 6 on the socket to exactly the same pins on BOTH plugs. Then connect pin 8 on the socket to pin 8 on the plug for joystick#1, and pin 9 on the socket to pin 8 on the plug for joystick#2 (NOT pin 9, notice). And that’s it.